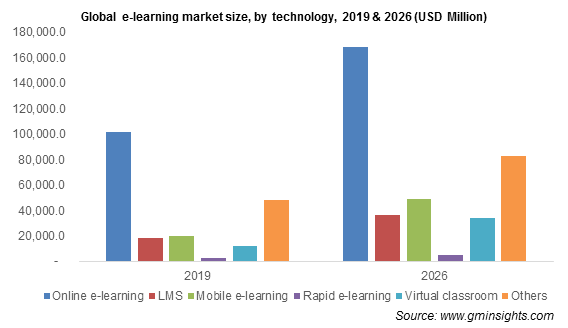 E-Learning Market size valued at around USD 190 billion in 2018, will grow at a CAGR of 7% from 2019 to 2025. The rise in the adoption of technology-enabled teaching & training techniques is driving the e-learning market growth. Some of the major emerging technologies in the industry include AR & VR devices, AI platform, Big Data, machine learning, and wearable devices. These technologies are allowing several businesses as well as institutions to share and deliver education-based content in innovative and interactive methods. For instance, QuoDecK is offering a SaaS-based e-learning platform that uses gamification for enterprise learning and training purposes. The platform utilizes games and interactivity to engage the learners and provide them the required training to perform their job roles. Moreover, several service providers are offering learning platforms to students to help them access study materials online and attend virtual classrooms & chats with any course specialist to clear queries related to various subjects or topics. Increased effectiveness of these programs with the help of PPTs, videos, and animated clips or images is a major factor driving the market growth. In recent years, cloud computing has grown in prominence and is anticipated to replace conventional systems over the forecast timespan. As e-learning systems require many hardware and software resources, cloud-based e-learning provides massive reductions in operational costs, allowing users to have exposure to the content through the internet, eliminating the need to download and install specific software requirements for applications. For instance, Duolingo is a cloud-based and free learning platform that educates users on a variety of languages including Swahili, German, and French and does not require the need for specialized hardware for usage. Learning games in phones and televisions combine entertainment and education for the younger age group. Such factors are anticipated to positively impact the market size. In 2018, learning management system (LMS) technology will witness high adoption in academic and corporate sectors to reduce the training expenses and offer integrated training or learning modules to the employees or students. These software technologies help businesses in documentation, administration, recording, and tracking the employees’ performance or scores. With content delivery, LMS also handles course administration, registering courses, and skill gap analysis. These software tools are witnessing increased applications in different scenarios such as compliance training, financial services, online assessment, computer-based training, application sharing, and collaborative learning. Moreover, companies are also utilizing LMS tools as performance management systems that encompass competency management and employee appraisal, augmenting the e-learning market demand. The content providers operating in the market are witnessing high growth due to the increased demand for course materials to train or educate employees or students. These providers are partnering with companies that offer LMS solutions. Software companies are incorporating the content offered by these providers into their solutions to deliver complete training modules to end users. For instance, in July 2018, UpsideLMS, a technology provider, partnered with BizLibrary, a content provider. This partnership will allow UpsideLMS to add new and ready-to-use video-based training content and off-the-shelf courses to its business portfolio. These providers collect and offer content on a diverse range of topics by contacting field experts that aid them to develop the learning content. Some of the major content providers in the market include SweetRush, Kineo, Infopro Learning, and AllenComm. The corporate sector is witnessing high adoption of these technologies due to the increased demand for effective training courses for employees. The sector is anticipated to grow at a CAGR of around 8% from 2019 to 2025. The corporate businesses are investing highly in incorporating modern learning technologies into their facilities to help employees to understand business policies and their job roles through an interactive medium. These businesses are transforming their traditional training techniques that include workshops and conferences to more affordable and efficient electronic training platforms. They allow companies to train new or promoted employees through video or software-based training programs. It becomes difficult for the corporate sectors to employ a different trainer, every time a new employee is appointed. Such factors are encouraging these businesses to implement an advanced knowledge base for their staff, providing an impetus to the e-learning market share. 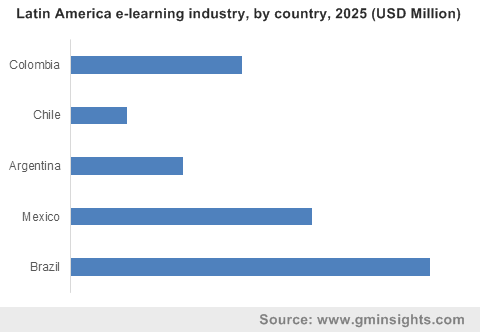 The Latin America e-learning market is anticipated to grow to reach over USD 10 billion by 2025, due to development of educational institutions for uplifting the literacy levels of the region. In markets including Brazil, Mexico, and Argentina, the government bodies are investing highly for developing education platforms for students. For instance, in May 2018, the Brazilian government announced investments of around USD 270 million in training the teachers throughout the country. With the rise in such investments, the demand for cost-effective learning technologies is growing rapidly in the market. Moreover, the rise in the internet access to citizens in the region is accelerating the demand for online courses. The Brazil higher education market has witnessed quantitative and qualitative levels of significant advancements and developments. The development has been the result of an increase in significant enhancement in the quality of education imparted and the number of institutes. Major players operating in the market are Adobe Systems, Inc., Aptara, Inc., Citrix Education, Cornerstone, Meridian Knowledge Solutions, NetDimensions., Microsoft Corporation, SAP SE, Oracle Corporation, Learning Pool, Cisco Systems, Inc., Apollo Education Group, Allen Interactions, Inc. and CERTPOINT Systems, Inc., among others. These companies are providing wide range of solutions and services to government, academic and corporate sectors. Moreover, the industry is experiencing increased partnerships between service & technology providers for enhancing business offerings to customers. For instance, in January 2017, Coursepath and ILT Solutions announced an e-learning partnership, to offer its partners and employees a tailor made and fast access to the software tools. 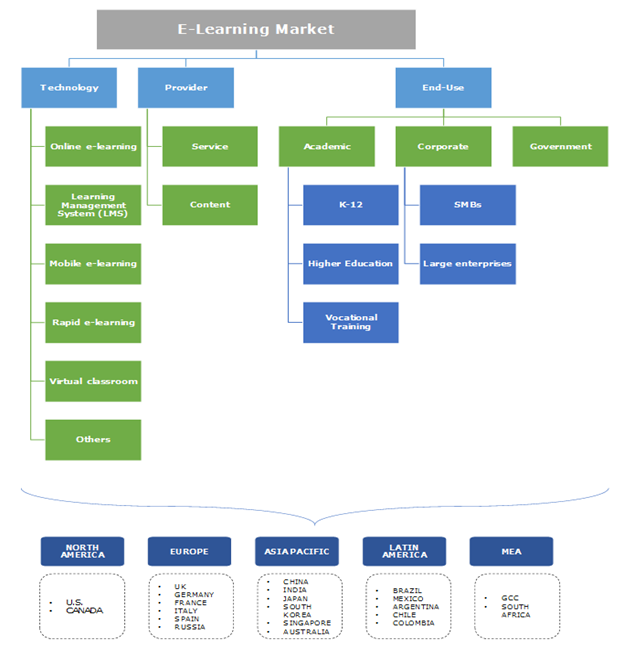 The e-learning market includes a large number of players that are expanding their business operations around the world. The strong presence of global players that are investing highly in setting up their business base in different countries, driving the industry growth. The players are focused on offering their solutions and services to the countries, where favorable government policies and high development in the education sector can be witnessed. Increased government push toward online courses and education platform is providing great opportunities to the market players. Moreover, the corporate sectors are focused on hiring skilled and well-trained employees that will offer value to business operations and enhance enterprise productivity.